I got hooked on Decasia the first time I saw it several years ago. When I found out that Icarus Films was putting it out on Blu-ray, I had to see it again. Director Bill Morrison took damaged black-and-white film from various film archives and created a real work of art that can be triangulated by Godfrey Reggio’s Koyaanisqatsi, experimental filmmaker Stan Brakhage’s manipulated film, and found-footage master Craig Baldwin’s repurposed films. Having now revisited Decasia, I can say that it is still wonderful. There is no narrative here because the subject is the deterioration of the film itself. The action and images in these clips has been taken from their original context and made surreal and mysterious by that decay, wether the things seen are whirling dervishes, carnival rides, or kids on a school bus. Decasia is at its best when the deterioration works selectively on the film’s emulsion. Each frame is incrementally damaged so that the decay and the image together produce an organic effect that still conveys the original motion but now with a sublime difference. 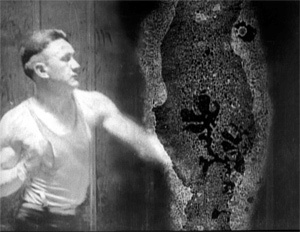 A boxer working-out on a punching bag becomes a man jabbing at an amorphous blob. The jabs and hooks land without any effect while his hands disappear into the pulsating mass. The scene is both comic and disturbingly futile. Morrison’s hand is felt in the editing and in some adjustment to the frame rate that slows the motion down. Some edits are more obvious than others. For instance a scene of an ant nest being disturbed is set next to an urban crowd standing around what seems to be a large building on fire. Both scenes are shot from above with lots of swirling activity by many individuals moving as one mass while at the same time distorted by the decaying film. Added to this visual mix is the original score by Michael Gordon. Apparently “Decasia” (the symphony) was first performed with the footage as a multimedia addition projected while the orchestra played. To my ear, Gordon’s score is a solid modern piece heavy on rising tension and light on lyricism. The film without this score would be something altogether different. In fact, I have tried watching Decasia accompanied by Mahler’s 4th Symphony and the effect is rewarding... particularly in the slower frame-rate passages. Now I’m wondering how some strident Shasticovich or anglular Bartok would play out. But why bother watching a pile of damaged film that has no narrative? Here are 4 reasons why I think Decasia matters. 1) It is film as Film with a capital ‘F’... ars gratia Artis. A lot of ink has been spilled decrying the death of Film and its replacement by digital Movies. But I say to the cineastes, don’t worry. If anything, we may be seeing the real birth of Film as Fine Art. I say that because perhaps the same thing that happened to painting will happen to Film. When photography was invented In the mid-19th Century, it immediately began replacing hand-made images as the preferred way to record the world around us. Photographs were cheaper, faster, and impersonally accurate. The primary function of painting had been removed. What was a Fine Artist to do? They kept on painting. But now free of the practical need for narrative and journalism, painting could be about, well, painting. It became art for art’s sake. Perhaps we are on the verge of film gratia Film? 2) At last there is a physical difference between Film and Movies. Up until now, “Film” was that high-brow word for cinema-with-content and “Movies” was everything else: all the low-brow stuff with giant robots, crashing cars and talking animals made for the audience’s amusement. We may have come to the point where — if my art for Art’s Sake argument is correct — a Film really is only film and the act of projecting light through that film will be conciously part of the experience. Perhaps the dramatic narrative will also take a back-seat to the performance of a projected presentation in the same way that some paintings have subjective content without it being the object of the painting. The work of contemporary painter Wayne Thiebaud comes to mind. The fact that I’m watching a digital version of Decasia is akin to looking at a photograph of a painting. Since Decasia is only available on Blu-ray, perhaps this is the coffee table art-book version? You get the general idea of what the thing is, but it’s not the real deal. i.e. projected film, with live orchestra, and seen in a dedicated viewing space. 3) It’s computer-enhanced not computer-generated. Generally speaking, I prefer any film that is at worst only computer-enhanced in it’s making but preferably I’d have it computer-free. At first I was disappointed to find out that there had been some computer-aided touch-up work in Decasia. But then I thought, why not? If you have a tool at your disposal, it should be used. Refusing to use computers would be simple Luddism. And by using that tool, Morrison has taken his intent past simply editing the order and duration of the scenes in making Decasia a work of art. At the same time, the computer enhanced version violates Reason 2... unless I suppose the final product is transfered back to film and then that is projected. It is a conundrum. But we’re out on the edge of Fine Art here; who knows what is allowed and what isn’t? 4) Decasia is not stupid. So much of what gets shown these days (oh what the heck, “always” has been shown ) is stupid. Now stupid can be fun and often the more stupidity the greater the fun. But for me, Decasia is a mysterious pleasure that I can see again and again for the work of art that it is. There is one extra feature, Light Is Calling (2004), a 6-minute short film by Morrison cut from the same cloth as Decasia but still nice stuff. Here we have an actual narrative as well as the decay. The extra features I would have liked to see would be literature on where the footage came from and some added back-story to the colaboration between Morrison and Gordon.